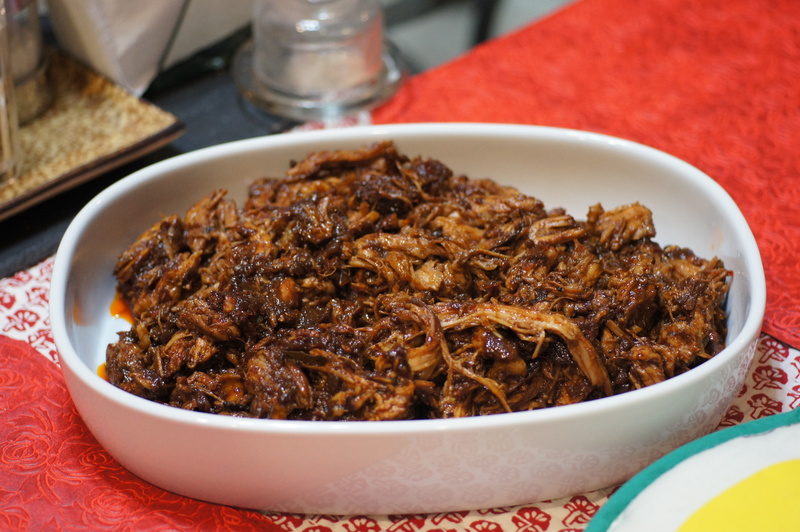 This dish is the net out of a beautifully chile braised pork shoulder and poor memory. The flavors are big and bold, just like you would expect and the aromatics while it was braising wafted throughout the house. It’s a wonderful fall meal. I probably should thank the Baby Lady for the inspiration for this dish, if I remembered it was her idea. 😮 You see, we had a 2.5 lb pork roast I had thawed out and Quickstep was coming over for dinner. She had recommended I do what her mother did and make a red chile paste and braise it. Being off in my own little world, I dismissed it without another thought and quickly forgot about it. We had been on one of our chile streaks of late and I needed a change of pace. I was thinking of something more traditionally “Fall like” and with our fresh little pomegranates, to boot. Yep, that was the ticket. Then I got to looking at various recipes searching for ideas and something that would truly be inspirational. As I was pondering reality and the Higgs-Boson I stumbled upon a recipe that for some reason struck my fancy, Chile Braised Pork Tacos. I don’t know why it is that Southwestern/Mexican cuisine always catches my attention but it does. I’m helpless about it. I see it, I like it and want to cook it. Also, I had recently purchased some beautiful ancho chiles at the market, Quickstep was coming over for dinner and he loves Mexican food, particularly tacos. Of course, Quickstep likes food period, any food, but he does particularly like Mexican food. 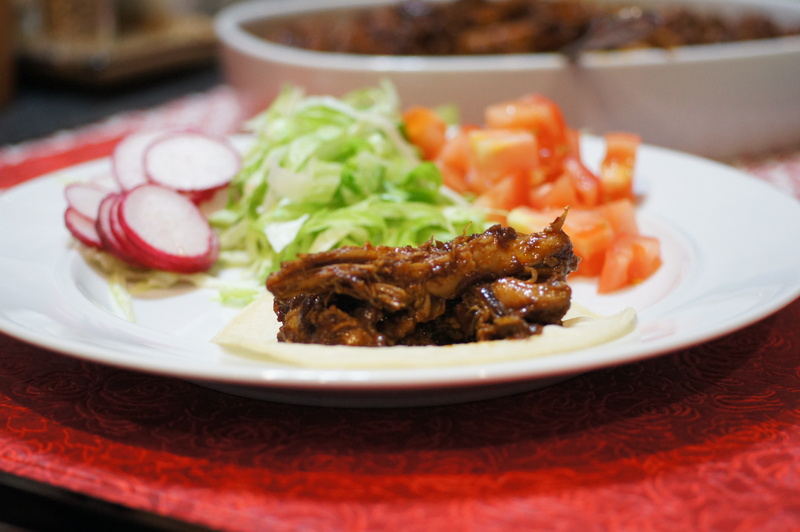 So with this in mind, I set upon the appointed task of making my version of chile braised pork tacos with a variety of different red chiles because of the greater depth of flavor and character you get from multiple chiles. 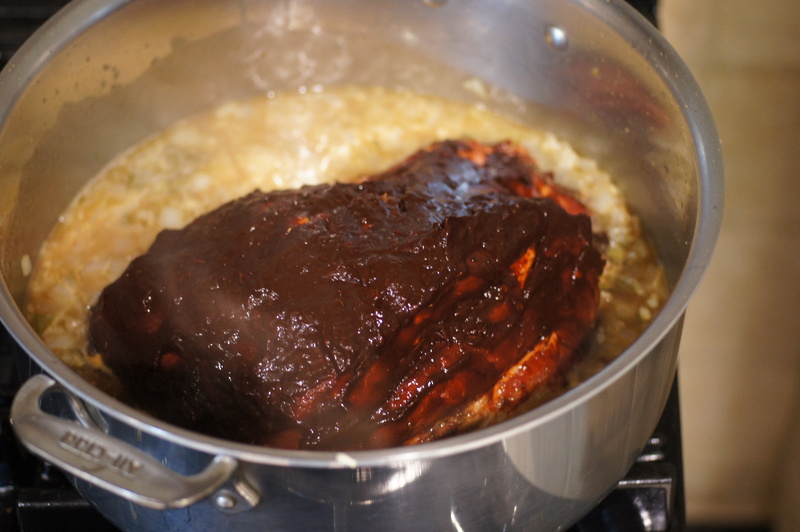 Of course, when Baby Lady realized what I was doing, she asked “So you decided to take my advice after all and do what my mom used to do – make a paste out of red chiles and roast the pork?” And my obvious and oblivious response was “no, I’m braising the pork in a red chile paste.” This then started the discussion of whose idea it was to make a red chile paste for the pork roast and how to cook it, along with another discussion of how my memory is slipping. Hmmmm…Regardless of whose idea this was and whether my memory is slipping, this is a wonderful preparation. Next time you’re in the mood for a taco, give this a try. Stem, seed and lightly toast chiles. Place chiles in a medium bowl. Add enough boiling water to cover, and set a small plate or bowl on chiles to keep submerged. 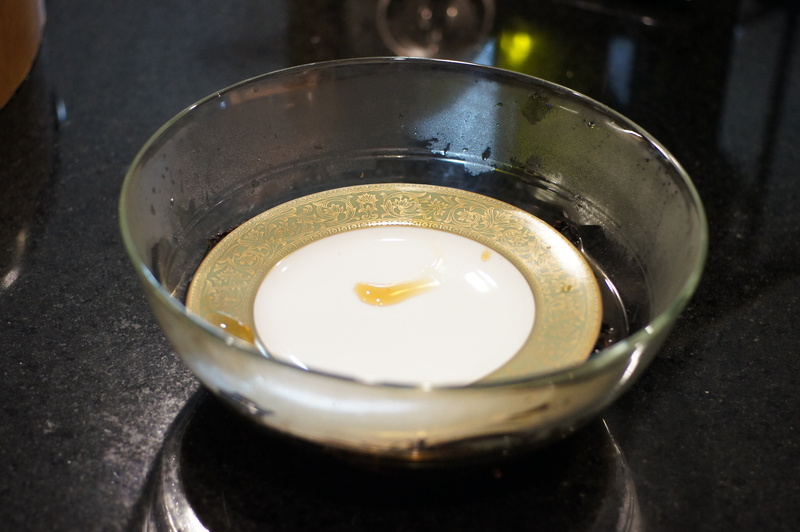 Let soak until softened, about 30 minutes. Drain and reserve the liquid. 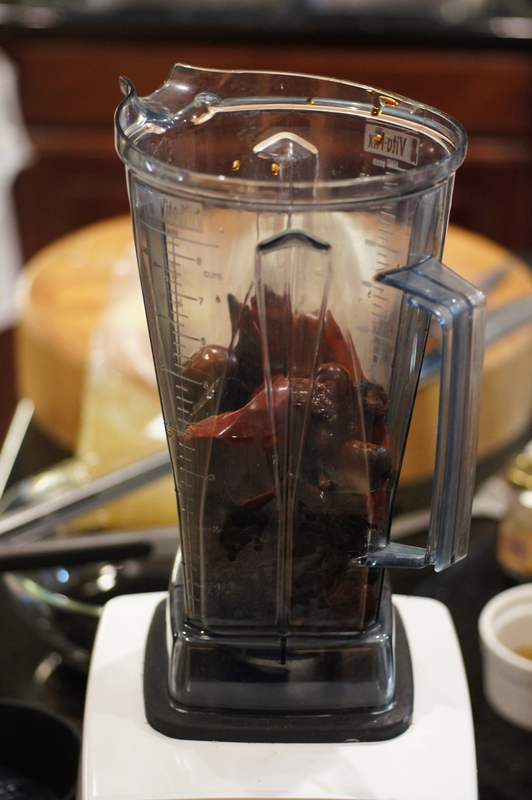 Place chiles in a blender. 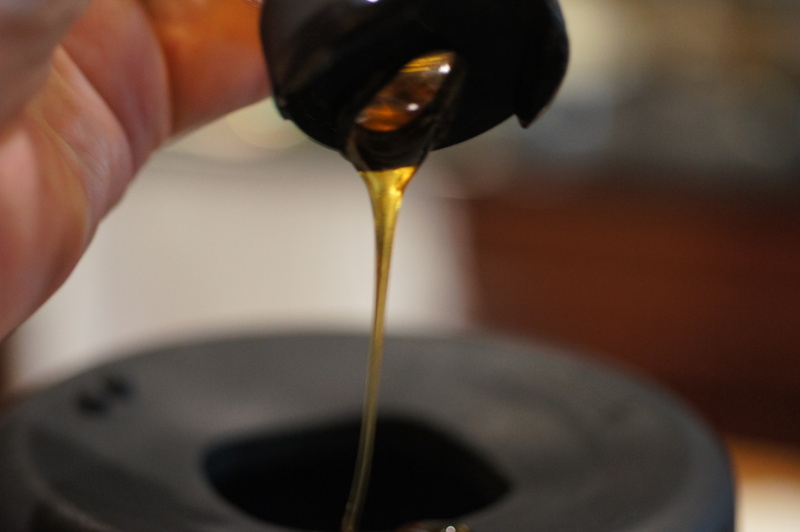 Add honey, lime juice, and 1/2 cup of the reserved liquid. Purée chile mixture to form a smooth paste. Add more liquid as needed. 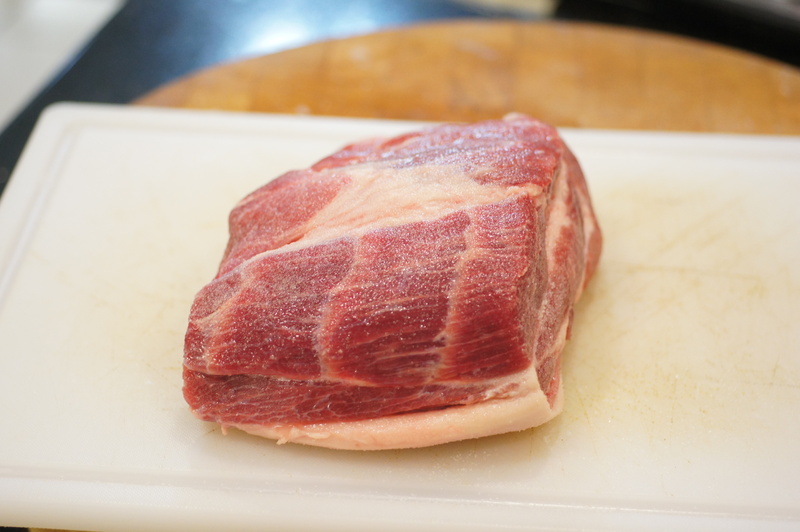 Season pork shoulder generously with salt, roughly 2 Tbsp will do the trick. 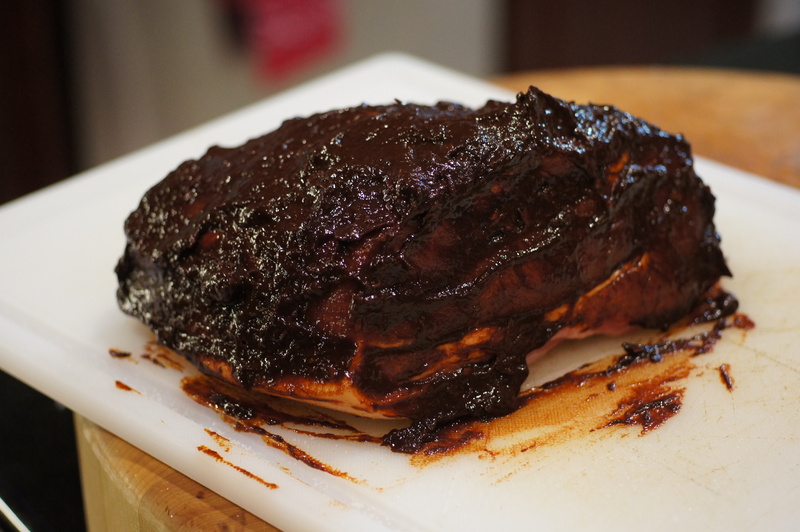 Generously spread the chile paste all over the pork shoulder. 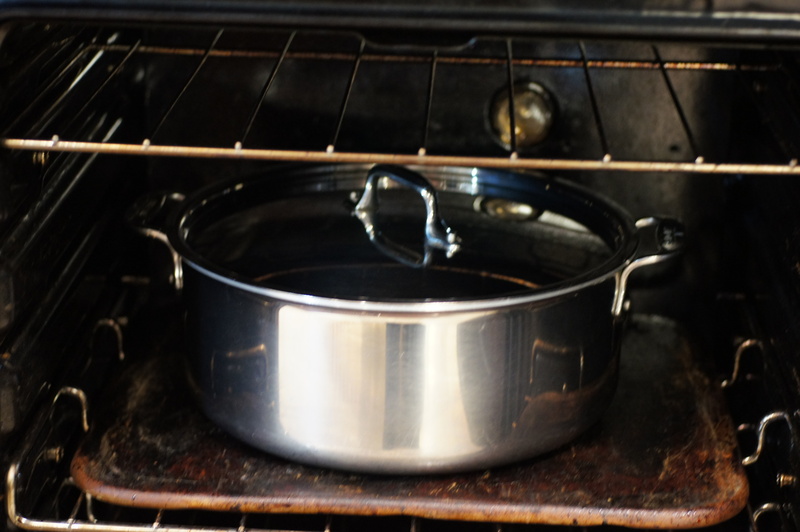 Heat a large heavy pot over medium heat. 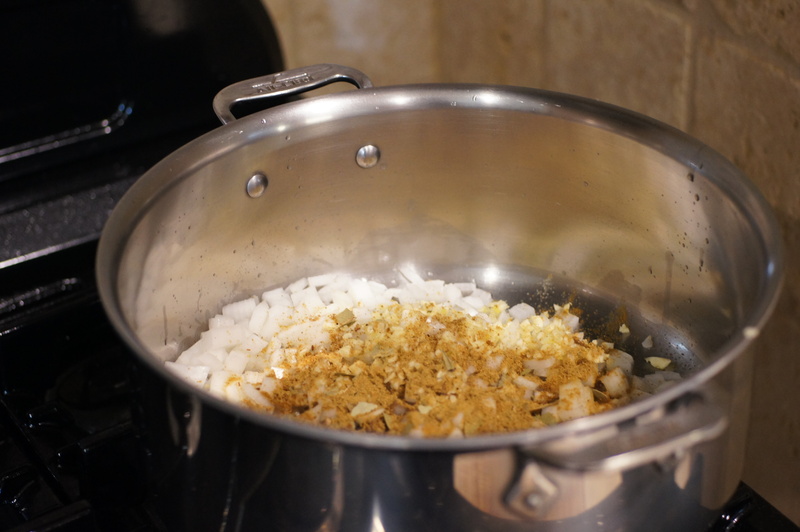 Melt lard and add onion, garlic, bay leaves, oregano, coriander, cumin, and allspice. Sweat onions until soft, roughly 8 minutes. Add chicken stock, bring to a boil and add pork shoulder. Cover and transfer to 350 F preheated oven. 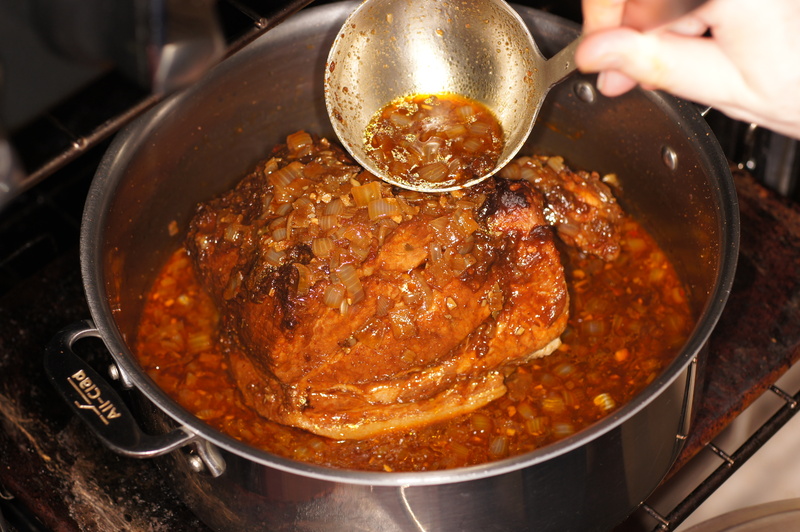 Braise pork for roughly 2-1/2 hours, until very tender, basting occasionally with pan juices. When done, transfer pork to a large plate and shred with 2 forks. Return shredded meat to pot and mix with remaining juices. Pour into a serving vessel. Meanwhile, heat tortillas and wrap to keep warm. Chiffonade lettuce, seed and dice tomatoes, slice radishes, serve & enjoy! Richard, love this! Absolutely delicious! Baby Lady says to do this in a crock pot but I’m just not a crock pot kinda guy! I’ll reserve half the marinade for later, thanks for the sneak peak! You get an entirely different flavor and texture from fresh chiles. A fresh poblano has some fruity flavors, yet still a green taste, with moderate heat. Being fresh, it also has more water and a outer skin like cellophane. The orange chile, if it looks like lantern, was either a scotch bonnet or an habanero. 😮 Spicy, spicy, spicy! Because these were fresh chiles, you will have an almost impossible time to produce a chile paste, which explains why it burned at the 2 hour mark. Nevertheless, I am sure it had wonderful flavor. Ancho chiles, being ripened, dried poblanos, amplify the fruitiness and provide some undertones, like dark red fruits, prunes, and even hints of chocolate. The guajillo chile is thinner skinned chile and is a dried Mirasol Chile with green tea flavor and berry overtones. The cascabel is a small round chile that is called cascabel because it means rattle in Spanish. It looks and sounds like a baby rattle. Cascabels have a rustic, nutty flavor. Because these chiles are dried, you have to soak them to rehydrate them and make them tender. Once rehydrated and tender, you put them in a blender and puree them. Depending upon your blender, you may have to strain them to remove the tough, cellophane like skin. In this application you rehydrate them and make a paste which is then applied to the pork. 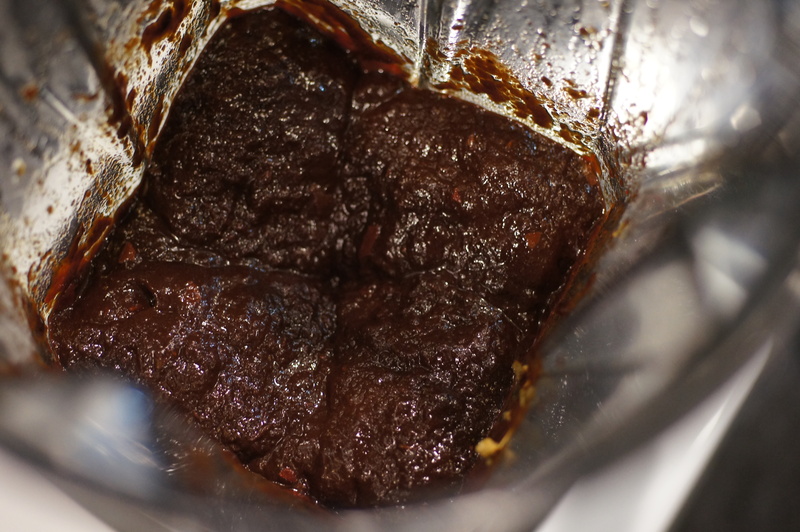 Although this paste is harder to burn than fresh chiles, they can still burn. Covered and braised, however, it is difficult to get this to burn. If you cannot find these chiles in NY state, you may need to buy them online. We keep them in large plastic containers. If you keep them otherwise, they are known to attract insects of all kinds! 😮 While I love ristas (strung dried chiles) and they look beautiful, we will not have them in the house because they are such an insect magnet. Our youngest son lives in Portland, Me. He is able to find Ancho and chipotle chiles there but not the guajillo. Find out where the hispanic folks shop and I bet you will find the ancho chiles. Up to your usual standard Richard. It looks very tasty indeed. Thanks, Conor, for your very nice compliment! It was very tasty. Oh this looks amazing. This would be a great change from our regular tacos. Thanks. 🙂 The flavors in this are amazing. I hope you give it a try. Definitely look forward to making this dish! The finished product looks so delicious. Thanks for dropping by and the nice compliment. If you give it a try, please let us know how you liked it. MMMM! The spice paste looks awesome! I find that the quality of chili used is central to getting good flavor. Accept no imitations, New Mexico Chile Rules! If you want to try some of the best, which actually comes from a small valley in New Mexico, get some Capsicum Annum Chimayo. Thanks for dropping by and your comment. I agree with you that quality chile is critical to a recipe like this. I also love New Mexico chiles; however, there are so many different varieties of chiles, many of which are not grown in New Mexico. I used the blend of chiles selected in this recipe because each one had unique flavor characteristics that complimented each other very nicely. There are other chiles you could use but these brought to the table the characteristics that I wanted. Thanks, again.